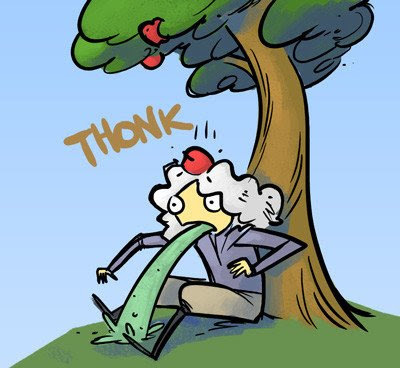 The picture above comes from CRACKED.COM's look at the "Five Lies We Were Told About History" - this cartoon was featured in #3 Newton and the Apple. You've probably heard of Isaac Newton. In the late 17th century, Newton practically invented science. The discoveries we can thank him for include the laws of motion, the visible spectrum, the speed of sound, the law of cooling [thermodynamics], and calculus. One wonders if anybody in history ever had a thought before Newton. While most people would merely think "Ouch!" and stare warily upward for 10 minutes, Newton's first instinct was to formulate the entire set of universal laws governing the motion of gravitating bodies, a theory so sound that it went unchallenged and unmodified for over 200 years. [Conduitt] "Whilst he was musing in a garden it came into his thought that the power of gravity (which brought an apple from the tree to the ground) was not limited to a certain distance from the earth but that this power must extend much further." Nice article. Until now I hadn't heard the part about him throwing up. It's amazing enough that Newton postulated what he did, but even more so that he had to invent the mathematics to prove it! It took someone equally brilliant (and forward-thinking) to challenge and disprove some of those notions 200 years later.